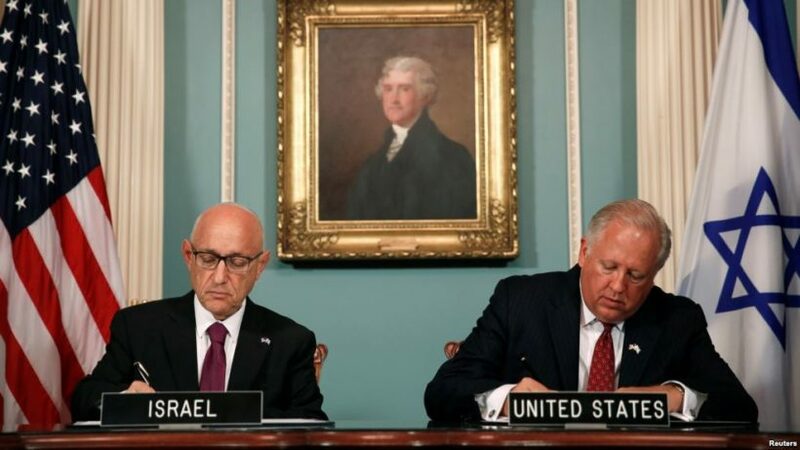 Israeli Acting National Security Advisor Jacob Nagel (L) and U.S. Undersecretary of State Tom Shannon are seen signing a new ten-year pact on security assistance between the two nations at the State Department in Washington, Sept. 14, 2016. (by Matt Spetalnick, Reuters) WASHINGTON — The United States will give Israel $38 billion in military assistance over the next decade, the largest such aid package in U.S. history, under a landmark agreement signed on Wednesday. Nearly 10 months of drawn-out aid negotiations underscored continuing friction between President Barack Obama and Netanyahu over last year’s U.S.-led nuclear deal with Israel’s arch-foe Iran, an accord the Israeli leader opposed. [The Iranian government has called for the destruction of Israel on numerous occasions. It is believed that once obtained, the Iranian government would use nuclear weapons against Israel.] The United States and Israel have also been at odds over the Palestinians. 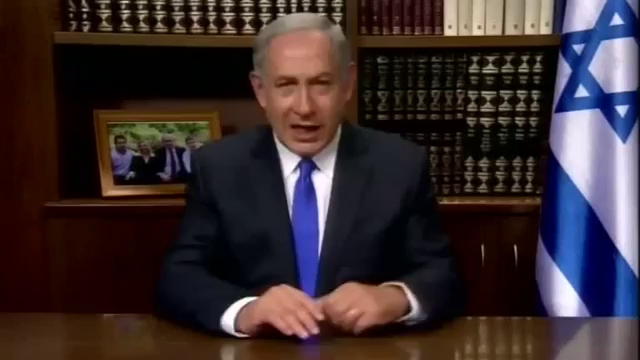 But [Prime Minister] Netanyahu decided it would be best to forge a new arrangement with [President] Obama, who leaves office in January, rather than hoping for better terms from the next U.S. administration, according to officials on both sides. “Prime Minister Netanyahu and I are confident that the new MOU will make a significant contribution to Israel’s security in what remains a dangerous neighborhood,” Obama said in a written statement. $500 million a year for Israeli missile defense funding, the first time this has been formally built into the aid pact. A phasing-out of a special arrangement that for decades has allowed Israel to use 26.3 percent of the U.S. aid on its own defense industry instead of on American-made weapons. Elimination of a longstanding provision that has allowed Israel to use about 13 percent of the U.S. aid to buy military fuel. The funding will allow Israel to update “the lion’s share” of its fighter aircraft, including purchasing additional F-35 Joint Strike Fighters. Israel is scheduled to receive 33 F-35 aircraft, the first two of which will be delivered in December. 2. List the three main provisions contained in the agreement. b) What concessions has Israeli Prime Minister Netanyahu made in the agreement? 4. For what reasons has Prime Minister Netanyahu signed this agreement now? 5. Why did President Obama want to make this agreement now? 6. a) What do Republicans accuse President Obama of doing in regard to our longtime ally Israel? b) Ask a parent or a grandparent: do you think this is a fair assertion? Please explain your answer. 7. President Obama is perceived by conservatives as being hostile in his relationship with our longtime ally Israel. If you agree, why do you think this is so? If you do not agree, why do you think people have this perception? Explain your answer. a) How important do you think it is for the U.S. to support our historic ally Israel? b) Do you support the deal the Obama administration made with Israel? Why or why not? For background, read “Roots of the U.S.-Israel Relationship” at jewishvirtuallibrary.org.